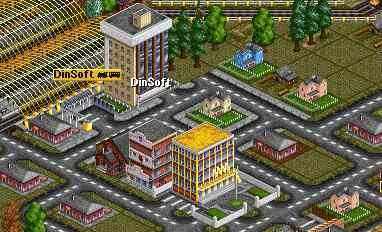 Our Head Quarter village Dinsoft has almost 800 inhabitants. The office was completely rebuilt the last year. We have now a very nice, multi-floor office. The next ten years we will concentrate on consolidation. The income of the trains is again increased last year. We have to keep this going up. Our loan is still on an acceptable level, $220,000. The bank balance is now increasing rapidly. We earn about $5.000.000 yearly. It is always good to pause the game and to look around for things to be improved. Click on a railroad station and look how the local ratings are. For example Tenington Woods goes very bad, only 37% of the produced wood is transported. After our look around to the stations, we should look also to the trains. There might be a train, which does not earn money. At the beginning of the year; we have to look only to the past year. If that is minus, there is something wrong. WWW Transport has several of these trains, but it is not so bad. They are used to connect small cities and to stimulate the growth of the cities. For other trains, like coal trains, it is different. They must always make money, if not, there is something wrong. In April, we made a new tunnel in the railroad between Fledingville and Tatfield Central. The tunnel starts now much lower in the mountain, so the train does not have to climb so much. This will reduce the travel time between the two cities. The new tunnel is on the right in "transparent" view mode. In the mean time it is already September and we need to have a look to the two wood trains where we had a look at in the beginning of this year. Well, there are still some problems with the wood transport from Tenington Woods. The rating is only 47% The extra track did not help so much. The other solution is an extra train. However, there are already two trains on this track, one to Tenington Wood and one to Ledinghattan Woods. But the wood production of Ledinghattan Woods is very low, only 70 tons of wood, this is even too low to make the train earns money. The other forest has a production of 270 tons. Therefore we let both the two trains go to Tenington Woods. As can been seen one of the trains make money, the other one not. We got on offer for a subsidy on a passenger transport. It is always an interesting business. We will try to get this subsidy. First we make a new station at Brubourne, but before we can do so, we have to plant some extra trees to make the inhabitants happy. Otherwise we wont get the permission to build a new station. Here it is very simple; there is already a double track station with one spare. After some very hard working the new train arrives on December 20 on Condinghall railroad station. We had really to disturb the environment at Condinghall to make the connection to the station. Therefore on the damaged areas we have to plant some trees otherwise the inhabitants will get angry on us. It is already 1991. The past year was not so bad. Our income increased again and our bank account is positive and we have no more loan.On the fifth of January we got the subsidy. The first earnings are only a $400 Well hopefully it will increase when there are more passengers. While we were trying to get a subsidy, there came a new offer for a passengers transport. This looks also an interesting business. We have to make a service between Condinghall and Penville. In the middle between them is Wrunthill City. There is already a station. 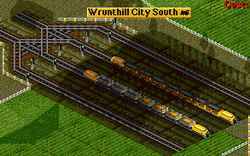 We go to move the train from Teddingville to Condinghall to Wrunthill City, there we make a new double station. Then there comes a new connection from Teddingville to Condinghall. On the 15 the of March we got the subsidy. One train goes another route and one train runs a longer distance, so it was replaced by a faster model. We were just working on a passengers service from Nunton to Great Chunborough when we received a new offer for a subsidy. It is a bit strange, it is the same one as a few months ago. So we will get for sure this subsidy. Our new train is up and running. As you can see Nunton is a small village in some hilly forest. Not bad to live there, when there is a good train service. We got also the subsidy, the same as before. Will bring in some more money. At the right you can see all our present subsidies. Indeed, we have two times the same one. The Fronthead Farm will double its production. Now they produce 90 tons of wheat and 90 tons of livestock. This will be a lot more when it is double so much. We have to keep an eye on it, to see if our trains can everything. Another interesting message, a new food plant under construction. After a quick look around there we found already one good producing farm without any transport to a food plant. New business! It is now the fifth of December and all work is done. We have two trains to Fennville farm, one for wheat and one for live stock. this farm produces 180 tons of each yearly. The the produced food is transported to New Pinhead. To improve passengers transport a new service was made between New Pinhead and Gefingway. This Gefingway if the closest village to the new food plant. We started with a new passengers service between Grenhattan Springs and Tinston. Then also a new passengers service between Dinsoft and Wrefingbourne. Then a subsidy is available for a wheat service from a farm to out new food factory. It is possible, but this farm is too small. To improve the transport situation around out office, on 25 May we replaced all the trains by new ones. From CS2400 diesel to Turner Turbo Diesel trains. One such a locomotive is $654,666, so we had again to borrow some money. ($600,000) But don't worry, we earn enough. We built a bus and a truck station at Tindhall Woods, to bring it closer to the city. Now it can receive the mail from Brubourne, they had 636 bags. The 20 the of June we could payoff our loan. This is very good, because we already need to replace an old train. We got also the same message for train 4. Since this one earns a lot more money, we will do train 4 first. On 23 September also the other train was replaced. In December we finished a new service between a small agriculture village, Fennville and Flondston. This new service will not direct make a lot of money, but it will help the development of these villages. Around the new station we planted some trees, this will make the Fennville people happy. More then one million dollar more then the year before. Hopefully we will grow a bit more and make sure that we are the top company of this world. There is already some very good news on the first of January, one of our already very good farms will double its production. We need to have a look if the transport facilities need to be improved. The 10 th of March a train was added to pickup the wheat and livestock from this farm. train 25 was also replaced by a new model and several passengers cars were added. The rails at Starfingfield Woods are improved to handle the three trains more efficiently. On 21 August a subsidy was offered. New transport service with two busses. A train was too complicated. On 22 September the first bus arrived and we got the subsidy. Wow, 50 % more money..
October 9, the trains keep us busy. Now train 10 is getting old. it ran already for 19 years, really time to replace by a new one. We replaced also train 14, between Starfingfield Woods and Senfingly. It has passengers, a food and a post car. The food cars are replaced by passengers cars, because on Senfingly there are over 600 waiting passengers. We earned about one million more then the previous year. Not so bad. Of course a lot of money was invested in new trains and new services. But that is what we want, growing bigger and become the tycoon of this world. We pause the game and look around if some improvement can be done. 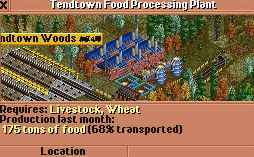 The food transport from the Tendtown Woods factory was very bad, only 39% was transported. The railroad was made double track and an extra train was added. The result of this will be visible only within a few months. Also in Slunningpool the situation was a bit bad, only 30% of the passengers were transported. From the 22 passengers available, only 10 were transported. The mail was even worse; zero bags out of 5. Here the old model train was replaced by a newer and faster one. Also the transport from Tatfield North is not so very good. We go to build here a double station and add another train. A problem was found when we tried to remove a part of the road, it is owned by another company. The most simple solution is to buy this company, it is very small, with only two vehicles and a value of about $450.000 No problem for us. So, now we bought this company and that damned road is now also ours. April 1994 So finally we could replace our station by a larger one. One problem was found, the new station came in touch with the bus station, previous owned by Gordon. Now our railroad station has another name and the "Tatfield North" name will disappear soon. However, we got also around 1000 passengers waiting on the bus station. They can now take the train. Now we have to look to where we can go with the other track of this station. We decided to go to Tinston. This is a village a bit far away to the south, at the foot of the mountains. It will be difficult to make the connection, but it will be a real challenge to do so. We start to change the station for a double track one. August 1994 the new railroad is ready and the new train is in operation. of course a Turbo Diesel with four Passenger Cars and a Mail Van. Just when we started with the new line, a new coalmine was founded. Since coal transport is a good business, we have to watch this mine to see its production. You still remember the new coalmine. The production is only 70 tons of coal, so not so interesting for the time being. When we made the station at Ronwood, we were not allowed to destroy a statute. Now, a few years later, it is not anymore a problem. As can been seen, the train has to go around the station, it comes from the left and enters the station at the right. So we take the opportunity to destroy the statute and to reroute the track to the station. As you can see, it looks much better now. The train can now enter the station direct from the left. 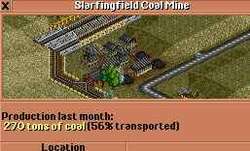 December 4 - From the Starfingfield Coal Mine, only 56% was transported. There were already two trains, but a long section of the track was through the mountains and was made single track. Now we have some more money we can change the last section to double track. Now the empty train can wait close to the station and arrives almost direct when the full train leaves the station. Another year passed. Our train income raised to a bit more then $10,000,000 Not to bad. We still have a loan of one million dollar. Just forgot to pay back. They don't send any reminder when you don't pay. We just paid $32,000 loan interest. We started this year with a new coal transport, from Gefingway Coal Mine to Fennville Power Station. Since the distance is quit long we made it already partly double track. prepared for two trains. On the 14 of March 1995 the train arrives at the Coalmine. On 22 April the train arrived at the power station. To be sure that there are no mistakes in the track or in the train settings, it is always good to follow a new train on its first route. Now you can also check its earnings. On May the 4 there was an accident, a bus was crashed by a train. This is a common problem with these kind of crossings. Since the train comes down from a mountain, the best is to make a bridge for the train. The 12 the of June the bridge is ready. Now there is a 100% safe situation. No more accidents. However, making these accidents is one of the methods to destroy the vehicles from the competition. Not so fair, but it works. However it should not be used when your own cars are on the same road. It produces already 180 tons With a double production this will go to 360 tons. That is a terrible lot. It seems to be a fertile area. It will be a big job to arrange the transport for all this. But that's our job, we have to become the Transport Tycoon. We have already a station close near. but the transport rating is not so very good. A big improvement of the railroad is required. We have to change the connection to the station at the Starfingfield Food Factory. The last single track is already used by four trains. Again one million dollar income increase. We have now 61 trains and 8 road vehicles. Begin of May the new track was ready. Also two more trains are put in operation, train 62 and train 63. Now there is place for all four trains. In the mean time we received some offers for a subsidy. There are three, but none of them is very interesting. The wheat service is from a farm with a very low production. Also the passengers service will not be paying very soon. However, there is still some interesting business to do; the village Fronthead has not yet any transport facilities. 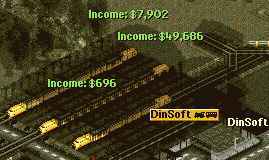 It would be very good to give the people there a train connection to, for example Dinsoft Wood Station. This gives the people from Frondhead the opportunity to work for an interesting and growing company. In October 1996 we got also a new type of bridge. it is the fastest one we have now, for a maximum speed of 321 km/hour. This type of bridge is very good and now we go to use it anywhere we can. On 23 November the railroad is ready and we can setup our new train. On 27 November the train arrives in Frondhead. it pickups 14 passengers and one bag of mail. Since Frondhead is a very small village, we go to build some buildings there. This is very expensive, but we do have enough money yet. We paid almost three million dollar. But not only new buildings are constructed, also the streets got a face lift, sidewalks, public lighting etc. The time goes very fast. We have to do a lot.A look around in this world shows that there are still three villages without any transport. These are: Tendtown, Paninghall and Ledinghattan. So we start with a passenger service from Tendtown to Gefingway. In Gefingway we have already a large station with one spare track. On April 14 the first train arrives in Tendtown. We use now always the Turbo Diesel because this one has the best reliability, 92%. The others are much lower. The first earnings of this train is only $1,742. It will improve as Tendtown becomes larger and larger. Just wait a few years. April 16. The next village is Paninghall. Here we have some problems. In the past we did of lot of railroad construction around this village. This caused some damage around the village. Now the local authority does not allow us to construct anything. Now our rating is "very poor". We are still not allowed to build something. So we wait some time. May 23. Now the last village: Ledinghattan. This is a very small village located in the eternal snow of the mountains. There are 63 inhabitants. If we want to get more people here, we have to supply food and to setup a passenger transport. We start with a double railroad station. A passenger transport to Grenhattan Springs and a food service from our largest food factory. July 16. The first train arrives in Ledinghattan. Now we start with the food transport, but at this moment the village is so small that it accepts only passengers, no mail, no food. But at the time that we are ready with the food supply line it is might be changed. It was a terrible lot of work. End of December we are just halfway at Sentwood. There the transport rating was around 40%. So we improved also this situation. A double station and a new line to Grendhattan Springs. Almost 2 million dollar more earnings this year. We are building all the time. Sometimes there is even no time to drink a coffee. This year we have to finish the food supply line and, if possible also connect Paninghall to the transport network. Begin of May the food supply line is ready and the train is in operation. Because Ledinghattan does not yet accept food, we put the train setting there on "Unload" Now we are sure that all goods are unloaded, if they need it or not. On July 5 the train arrived at Ledinghattan and the food is now at the station. To earn at least some money we put also a food car on the train from Ledinghattan to Grenhattan Springs. None of the two trains to Ledinghattan does make any money. Even the food transport costs us $10,000 But it will make the people happy. August 20. We own now 16 million dollar. What can we do with all that money? The bank does not give any interest, so we have to setup some new transport. Well, there is the Fledingville Paper Mill. They produce paper but there is no printing factory. We go to build this printing factory and we go to transport the printed goods to Dinsoft were we do have a need for printed documentation. September 23 we built a Printing Work near New Pronfingley. We made also a railroad and a bus station. One platform for unloading the paper and one platform for loading the printed goods to be transported to out main office in Dinsoft. 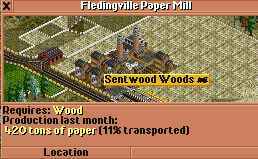 Beginning of December the new track is done and the first train fully loaded with paper leaves the station at the Paper Mill. The first train to the new Printing Works. Now we have to arrange the transport of printed goods to Dinsoft. The printed goods transport is not yet finished and the year is already over. We have first to finish the transport of the printed goods. We start with making a free platform on the Dinsoft station by deviation the train from Dinsoft to Wrefingbourne. Now this train goes from Wrefingbourne to Gadtown. February 26, the railroad is made, the new train in operation and waiting on the platform to be fully loaded with the printed goods. In the mean time we made a passenger service between the two railroad stations in New Pronfingley. Now the people can go by bus to their work at the printing works. On April 22 the train is loaded and leaves for our office in Dinsoft. May 10 the train arrives at Dinsoft Railroad Station. The earning is almost $50,000. At the same moment there are two other trains arriving. The good train seems to make the most money, but it depends also how many times the train makes earns money. We can see the total at the end of the year. June 1999 we got an offer for a subsidy. The involved village is Paninghall. A few years ago we were not allowed to build anything here. We gave them some new buildings and a lot of trees, but even now they want more. After we planted again a lot of trees we are allowed to build the railroad station. August 13 the railroad from Paninghall to Teddingville is constructed and the first train leaves the train depot. There are already 200 passengers waiting on the station in Paninghall. There was really a need for a passenger service; we are just in time. September 1 we got the subsidy, 50% more on these transport earnings. October 15. We got some complaints from Tindhall. They have a problem with the railroad station: it is too small for the long food train from Starfingfield Woods. There is also a pile-up of not transported food. Another problem was found on Tenington Forest. the wood production is very high and the transport is very bad, only 23% of the produced wood is transported. On December 6 we tried to improve the transport with a third wood train. Next year we must also improve the railroad itself by adding more double track sections. After 50 years in operation, we own 71 trains and 9 road vehicles. The company value is now more then 40 million dollar and the cash on the bank just a bit more then 10 million dollar.